At the invitation of the Irish Agriculture and Food Development Authority and University College Dublin (UCD), Wageningen University, the Netherlands, and the Rural Development Administration (RDA), South Korea, A delegation led by Prof. Chen Mengshan, Secretary of Leading Party Group of the Chinese Academy of Agricultural Sciences (CAAS), have visited the above-mentioned three national agricultural research institutions from April 22nd to May 1st, 2018. During the visit to Ireland, the delegation held talks with Mr. Andrew Doyle, Deputy Minister of Irish Department of Agriculture, Food and the Marine and discussed the strengthening of bilateral cooperation in science and technology projects in dairy industry and the building of a joint platform. Both agreed to promote the development of the “China-Ireland Dairy Science and Technology Centre Platform”, and to strengthen the cooperation in the areas of milk quality improvement, efficient fodder utilization and development of high-quality dairy products. The two sides held consultations on enhancing cooperation in food safety, with special emphasis on strengthening exchanges and cooperation in key disciplines such as standards, traceability and process control, both sides also reached consencus to enchance technical support capability for agricultural standardization and agricultural product quality and safety in both countries, so as to ensure agricultural products safety in quality, trade and consumption. The delegation also held talks with Prof. Dolores O'Riordan, Vice President of UCD and Prof. Gerry Boyle, Dean of the Irish Agriculture and Food Development Authority respectively, to promote cooperation in animal breeding and genetics, dairy production, sustainable agricultural development (including relationship between agriculture and climate change), food nutrition and food safety, detection of hazardous residues, and veterinary medicine. In-depth discussions were also witnessed in joint training of graduate students through exchange programs and joint education. Following the talks, the delegation inspected potato growing farmers and livestock husbandry farms. The visit to the Netherlands witnessed Prof. Chen Mengshan’s talk with Prof. Louise Fresco, President of the Executive Board of Wageningen University & Research, Netherlands, affirming achievements on cooperation between the two sides over the past 30 years. Consensus was reached to strengthen top-level design, establish a coordination mechanism and highlight key disciplines. 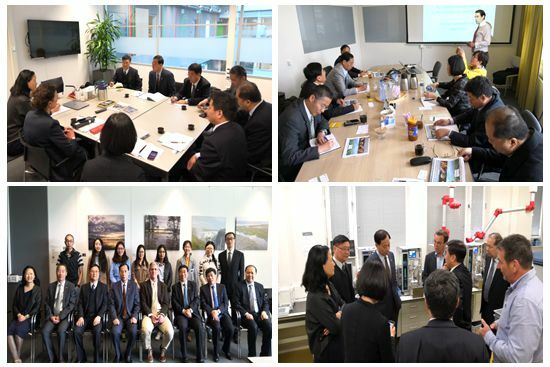 The two sides decided to promote key projects such as waste treatment, food safety, facility agricultural technology, rural economic policy and capacity building and accelerate the building of the Sino-Dutch Livestock Waste Recycling Center platforms. Following the talks, The delegation visited the breeding project base of the Solynta True Potato Seeds (TPS) Company in the Netherlands. They discussed the further cooperation on use of LED for seed breeding and held communication with CAAS students studying in the Netherlands as well. During the visit to South Korea, the delegation held talks with Prof. Ra Seungyong, Head of the Rural Development Administration, South Korea. The two sides conducted in-depth discussions on further increasing the level of cooperation and deepening and expanding cooperation in agricultural science and technology. Prof. Chen Mengshan noted that cooperation over the past 26 years has achieved satisfactory results, both sides would focus on the following four ways of cooperations: Firstly, to strengthen mutual visits of high-level delegations, highlight key disciplines and contribute more in innovation. Secondly, increasing investment to enhance and broaden cooperation, and bring the cooperation platform, including joint laboratories and joint research center in the field of crop research, into full play. Thirdly, boosting cooperation in science and technology to support rural revitalization and governance, and expanding sharing of scientific research resources and information. Fourthly, establishing a regular cooperation assessment mechanism, and systematically sorting out and determine key projects for the next 2 years by taking advantage of the 2018 CAAS-RDA Planning Committee Meeting in China. The delegation also visited tomato growers and Farmers’ Food Processing Cooperatives. The visit also covered a trip to the College of Agriculture and Life Science of Seoul National University (SNU CALS) and talks with Dean Suk-Ha Lee on strengthening cooperation in the field of crop sciences and capacity building projects. 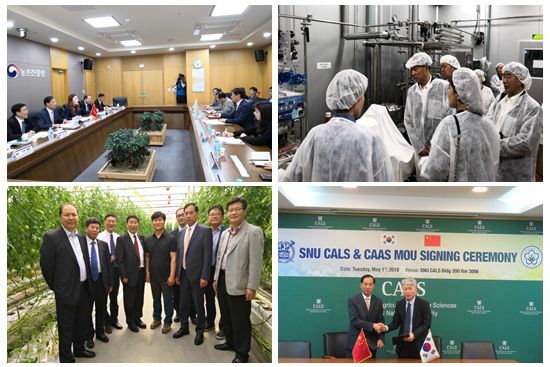 For the first time a Memorandum of Cooperation on Agricultural Science and Technology between CAAS and SNU CALS was signed. 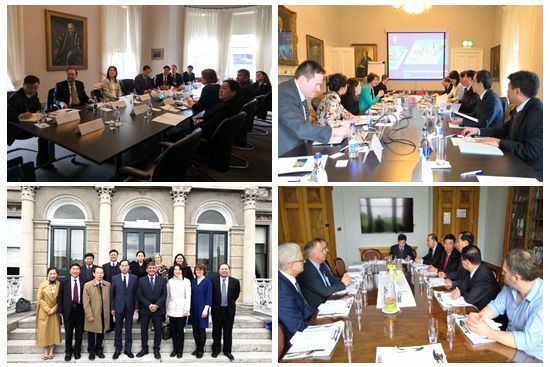 The delegation has exchanged views with Mr. Yue Xiaoyong, Chinese Ambassador to Ireland, and Wu Ken, the Ambassador to the Netherlands respectively.